HALAWA — The Saint Louis Crusaders had it their way against the Kahuku Red Raiders Friday night. Top-ranked Saint Louis jumped out to a 16-0 halftime lead and had eight total sacks to slash No. 2 Kahuku, 30-14, in an interleague Open Division matchup before a crowd of about 5,000 at Hawaiian Financial FCU Field at Aloha Stadium. 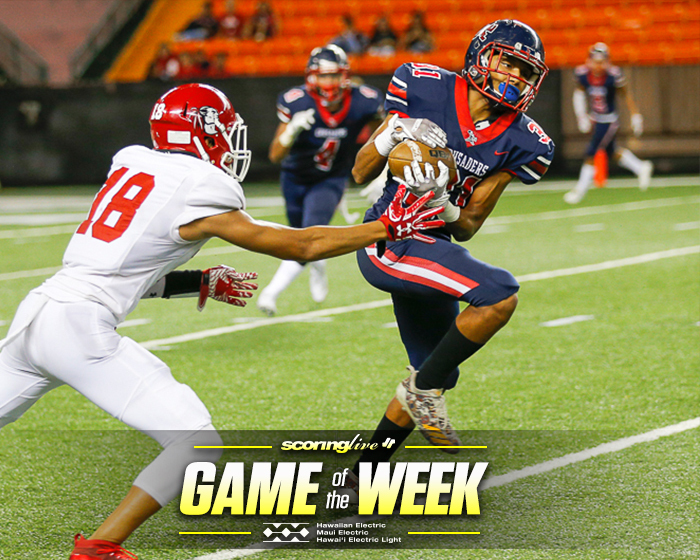 Wideout Roman Wilson added six receptions for 137 yards and two scores as the Crusaders picked up their third straight win over the Red Raiders to improve to 3-0 overall and 2-0 in the ILH standings. Kahuku, who last beat Saint Louis on Nov. 20, 2015 in the Division I state title game, dropped to 3-1 overall with the loss. "Saint Louis is the real deal," said Kahuku first-year coach Sterling Carvalho. "They was well-coached, they came out with a game plan, they executed it and that was the bottom line." The Crusaders' defense caused havoc from the get-go, sacking Kahuku starting quarterback Thorton Alapa on his first two drop backs of the night. The constant pressure in the first half derailed any momentum for the Kahuku offense as it gave up six sacks in the first 24 minutes of play and just 10 yards of total offense at the break. "We came out flat," said Carvalho. "Saint Louis came out as Saint Louis always does: fast; and they took advantage of us. Great teams do that. We cannot be flat and with our mistakes and our downfalls and expect to keep up with a top caliber team like Saint Louis." Nicholas Herbig led the defensive effort with a game-high eight tackles, which included two sacks. Other Crusaders with sacks include Stanley McKenzie, Gino Quinones, Jordan Botelho, Faatui Tuitele, Kili Kamakawiwoole and Timothy Timoteo. Saint Louis also recorded two interceptions in the game, one of which was returned 85 yards by Korvin Feagins for the Crusaders' final score of the night. Kamoi Latu had the other pick, which came three plays after Alapa was sacked on the first play of the second half. "We just came out and we had the mindset of just firing out against this Kahuku offense and just kind of play in their backfield," said Saint Louis senior defensive lineman Faatui Tuitele.